Start now and form healthy habits for the future. Heart disease isn't something we all actively think or talk about, especially those who are younger. But heart disease affects more Australians than we might realise. Some scary facts: Heart disease affects around 1.2 million Australians and is the single leading cause of death in Australia. In 2015 alone, it claimed the lives of 19,777 Australians (12 percent of all deaths) and kills one Australian every 27 minutes. Each year, around 54,000 Australians have a heart attack. This equates to one heart attack every 10 minutes. Heart attack claimed 8,443 lives in 2015, or on average, 23 each day. But many cases of heart disease can be prevented. And it's a great idea to lay down the right diet and lifestyle foundations now. "A man aged 55 has a one-in-two chance of having heart disease in his lifetime. Women have a one-in-three chance," Heart Foundation chief medical adviser Garry Jennings told The Huffington Post Australia. Can you guess which diet gets the most votes? "It's a bit of a forgotten problem and there's an assumption that you have your heart attack, your angioplasty or bypass surgery and you're all right, but that's really far from the truth as far as the overall burden of disease in our community -- both health wise and economically. "Poor diet is a significant contributor to those rates of heart disease. It is really a matter of the community having gone away from the basics that is freshly prepared food -- even 'meat and three veg' is still three veg -- to often commercially prepared food which is often fried in unhealthy oils." According to accredited practising dietitian and DAA spokesperson Joel Feren, making positive changes to protect against heart disease doesn't have to be an overwhelming experience. "There are numerous factors which contribute to heart disease, both environmental and lifestyle," Feren told HuffPost Australia. "From a lifestyle perspective, diet, exercise and alcohol consumption can certainly play a part. "There's a number of things we can do. It's about making small, subtle changes." Here are nine lifestyle and dietary ways to help prevent heart disease. "Things like a more plant-based diet would be really encouraging, so increasing vegetable and fruit intake," Feren said. "Unfortunately, the stats in Australian are pretty damning -- only four percent of the population, both men and women, meet their vegetable requirements. "Just over 50 percent of people meet their fruit requirements. Certainly fruit is a really easy one to eat." When we fill up on fruit and vegetables, we are naturally less inclined to fill up on other unhealthy foods like biscuits, lollies, chocolate and fast food. "For someone who does increase their vegetable intake, it may just displace some of those energy dense foods," Feren said. "The other thing that's critical in a healthy diet is variety and colour," Jennings added. "You can tell when you look around in a restaurant whether they're serving the right kind of food. If it's all the same colour or all brown, it's probably not healthy." Eating too much sodium over time can increase your risk of high blood pressure, which is a major risk factor for heart disease. "Salt a bit of a silent killer. If we limit the salt in our diet, that's certainly going to impact positively on our hearts," Feren said. "Salt is used not only as a preservative, but also to promote flavour. I often encourage my patients to use flavour alternatives like herbs and spices. When people reduce their salt intake, they notice it initially but their taste buds adjust over time. It's about getting used to it." Sugar is another factor to be wary of, Feren explained. "Sugar can increase particular molecules in our blood called triglycerides and high triglycerides can increase the risk of heart disease. It's pretty sweet news that if you do decrease your sugar intake, you can improve your heart health," Feren said. "I always talk to my clients about substituting like-for-like. If somebody does feel like something sweet, rather than opting for lollies or soft drinks, a piece of fruit would be a really good option or possibly some yoghurt -- but just generally cutting back on those added sugars." And don't worry -- fruit doesn't count as 'added sugar'. "While fruit is still a source of sugar, it contains fibre which is a nutrient that can help improve our hearts, and then you're getting all of those wonderful plant-based chemicals (like antioxidants), as well." Keep these as treats, rather than everyday foods. Fibre is your friend, not just for helping prevent heart disease, but for keeping your whole body function optimally. Fibre is found in foods like legumes, vegetables, fruits and whole grains like brown rice. "Fibre is my favourite nutrient. There was a study done last year published in the British Medical Journal that showed that increased whole grain intake was certainly associated with a decreased risk of cardiovascular disease," Feren said. 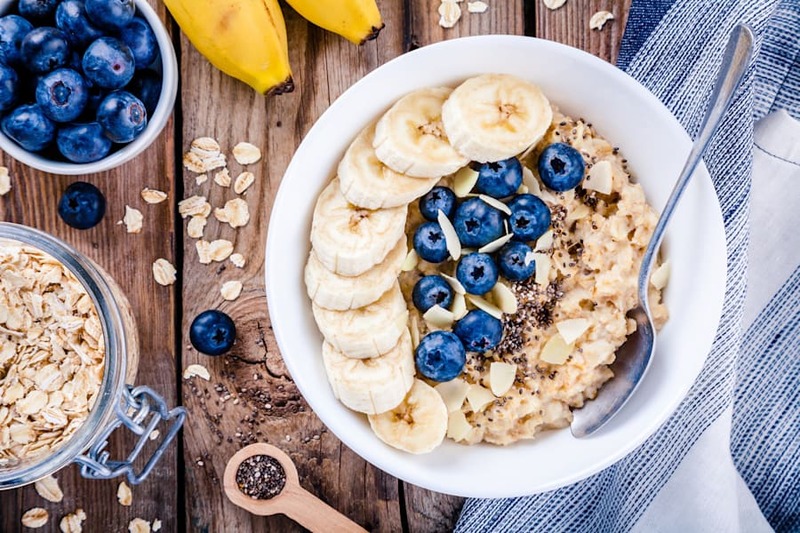 "Oats, in particular, contain a fibre called beta glucan and that's been shown to reduce cholesterol, thereby reducing someone's risk of heart disease. "Baked beans and legumes are great, as well. Baked beans on whole grain toast is a double whammy for fibre." Another good reason to have oats for brekkie. Unlike trans fats, monounsaturated and polyunsaturated fats like nuts and oily fish boost heart health. "Certainly there's some evidence around fish oils and omega-3s to improve heart health, heart rate, decreasing inflammation and increasing our good cholesterol. Sardines or smoked salmon on whole grain toast with avocado would be really great options," Feren said. "Monounsaturated fats like nuts, seeds and olive oil help improve heart health. Avocado is rich in fibre and also monounsaturated fats." "Have less of the energy dense foods which are generally high in fat and refined carbohydrates. These foods often have trans fats in them which we know are adverse," Jennings added. With more research coming out linking high red meat consumption with some cancers and premature death, Feren recommends integrating more soy products like tofu. "Two or three serves of soy a day is a great option for those who are mindful of their heart health and want to improve their outcomes," Feren said. "Clinically it's been shown to reduce bad cholesterol, the LDL, as well as triglycerides. And there's a little bit of evidence to show that soy can slightly improve HDL, the good cholesterol, and also reduce blood pressure. "Tofu is a great source of protein and is very low in fat and naturally low in salt, so it's a really good protein alternative." Try tofu stir fry, tofu salad or tofu schnitzel. Eating a balanced diet also includes some treats -- but it's important they stay just that. "With the availability of discretionary foods (confectionery, pastries and so on) these days, there shouldn't be much room in our diet for them," Jennings said. "I'm not saying you can't have treats, but treat them just as that -- treats -- and not as an everyday food." While your three-times-a-week gym sessions do help, incidental exercise or 'NEAT' is just as, if not more, important. "Exercise is absolutely critical. It does all the right things as far as prevention of heart disease, and also cancer and many other chronic diseases," Jennings said. "Physical activity can lower blood pressure, lower blood fats like cholesterol, prevent diabetes or lower the blood glucose, and of course, keep you strong and more able to get around and participate in other healthy activities. Go back to basics and eat more fruit, vegetables, seeds, nuts, lean meats, low fat dairy foods and polyunsaturated and monounsaturated fats. "The new thing, as far as exercise is concerned, is incidental exercise. We used to think of being sedentary as just not getting exercise, but actually it seems to be more than that." Daily life these days often involves a sitting job, recreational sitting in front of a computer or TV, and driving to work or sitting on a bus. "There are very few occupations now that involve physical labour. It seems that this in itself is adverse, not just for heart disease but for diabetes, too. Just breaking up your day with some standing and walking around can be helpful, on top of your 45 minutes at the gym." Gardening burns energy without you even trying. The diet which best encompasses all the above tips, and arguably the ideal diet to promote heart (and overall) health, is the Mediterranean diet. "Really, our recommendation is to go back to basics and eat more fruit, vegetables, seeds, nuts, lean meats, low fat dairy foods and polyunsaturated and monounsaturated fats. A good example of that, but not the only example, is the Mediterranean Diet," Jennings told HuffPost Australia.